Most recipes say to use a rolling pin to roll the dough flat after the first rise and then to tightly roll to shape the loaf. I always had an air pocket inside the finished bread doing this. I divide the dough in half and shape into two balls then start shaping the loaf. I just poke bubbles with a tooth pick if one shows up during shaping. I brought my levain with me on the plane to CO. Going try baking a sourdough out here. The starter really bubbles with the thinner air. Been trying to perfect my freeform loaves. Going to try using some of the local beers in it for flavor. I'm trying to make hash browns that I really like. Have used different methods and others ask for them again but I didn't think they were that great. Too moist in the center and too browned around the outside. Tried oven baked last night in the big muffin pan. Showing the build. 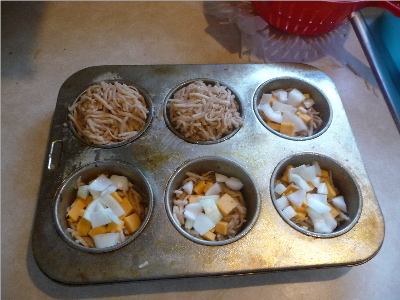 Onion and sharp cheddar cheese in the middle. Little more than one cup of shredded potatoes for each. 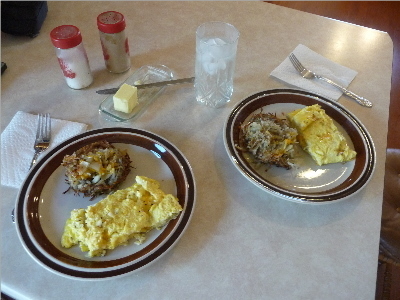 Cut a rather large onion and cheese omelet into pieces to go with the hash browns. I need some really good tips on making hash browns. 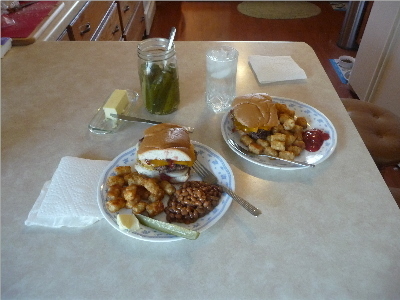 Night before last made cheeseburgers with some really good 85% lean ground chuck. Could have called them rare burgers with cheese. Cut some French bread for buns. French bread does not stand up to juicy burgers. Well that was very tasty! I spent some time in Utica NY in 1991... There was a couple little "street car" diners along my route to work that would open at like 4 AM and were closed at noon... They had the best raw fries! I did ask one of them how they prepared them... The answer was... Someone came in a 2 AM to start opening up... First chore was to scrub potatoes, wack em up, then throw them on the griddle while it was heating up... I didn't get there until about 5AM... Those were the crispiest eating potatoes I've ever had.. Still I can't make them like that... Perhaps need to be of the "moon shade" persuasion? Raw fries: I dice the potatoes into a bowl. Add salt and pepper stirring to season all the potatoes. Add 2 tablespoons of vegetable oil to bowl. Stir to coat the potatoes. Let sit for at least 15. Get pan hot without oil. Begin adding potatoes without any of the potato juice from the bottom of the bowl. Stir potatoes only after first side down is nicely browned. 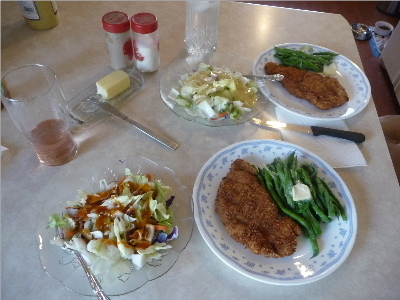 Last night was pork loin schnitzel with a salad and green beans. My wife really likes the schnitzel recipes. Only a minute of cooking time in the oil to keep the pork moist. 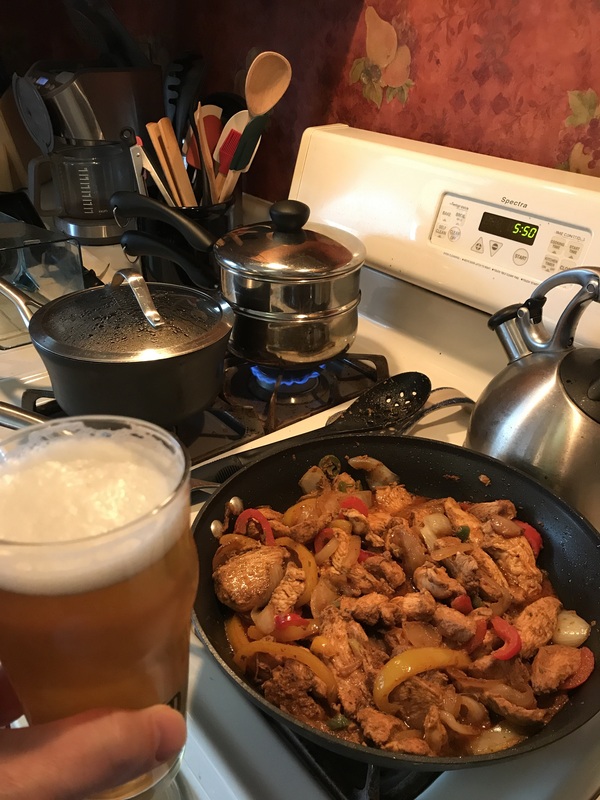 Chicken Fajitas with rice and broccoli, figured I’d put up an unconsolidated picture because with 4 kids, dinner tends to be chaos Oh and a Weizen to cook with. I realize it’s the wrong style glass but it enables variety in pours. So much for not drinking during the week. Tomorrow is rib smoking day. Supposed to be 49°F and sunny. Light breeze from the north. Good day to sit on the south facing front porch tending the smoker. This is what 4 racks of country style ribs looks like trimmed to St Louis style. Lot of small pieces for snaking treats. 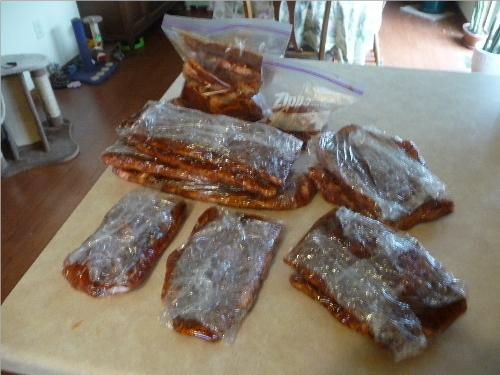 Ribs vacuumed sealed and ready for the freezer. What to do with those small vacuum bags that are saved. Make snack packs for the smoked trimming bits from the ribs. Pile of snack packs in the foreground. Not really. This was last nights meal. Smoked ribs from 11/16/2017. Easy to see they aren't smoked very well. They were slightly dry also. Now where are my notes for these ribs. There aren't any notes. I'll have to start taking detailed notes for smoked meats just like the detailed notes for brewing beer. 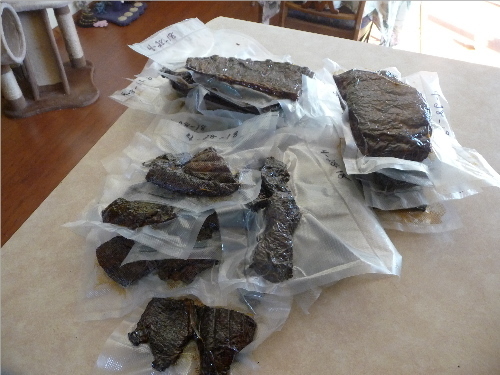 Letting the surface of the meat dry off also helps it absorb smoke. Usually keep the temperature low, below 150°F with the vents fully open, until the surface is dry to the touch. Maybe 30-45 minutes. You don’t want to get it hot enough to melt the fat, as it turns into a greasy mess. Then slowly up the temperature as you add smoke. Really important when smoking sausages, I never could get them to turn out until I started doing this. Works well for other smoked foods, too. Last night feeling lazy after a couple of beers. 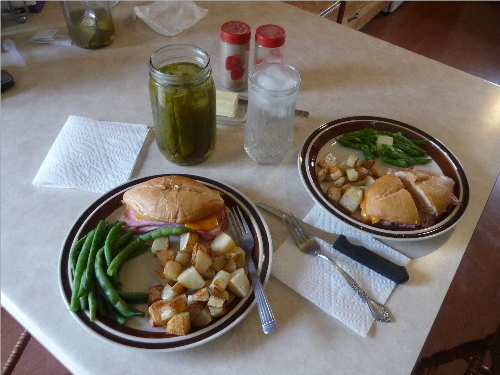 Hot ham and cheese sandwiches with raw fried potatoes, green beans, and garlic mustard dill black pepper pickles. 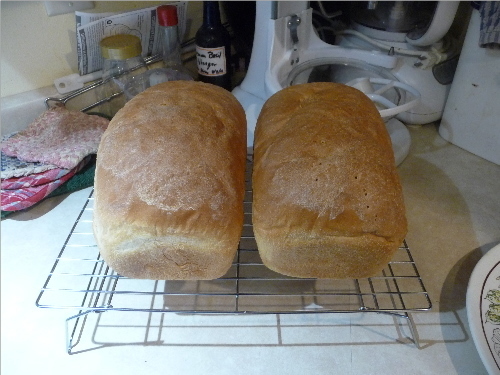 Made a couple more loaves of my white bread Tuesday morning. I've been experimenting with how much fussing is necessary shaping the loaf to have good bread out of the oven. Have found that how the loaf looks going into the oven doesn't affect texture or taste, but saves time. Both loaves had surface CO2 pockets after going into the pan. No holes in the interior. Used a toothpick to release the gas. I agree I'm kind of a glass snob. 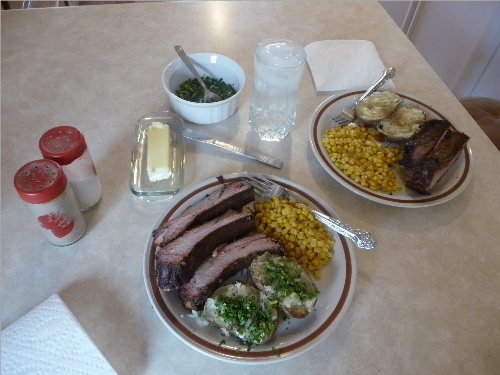 Way back when I was a restaurant cook I learned presentation is very important. 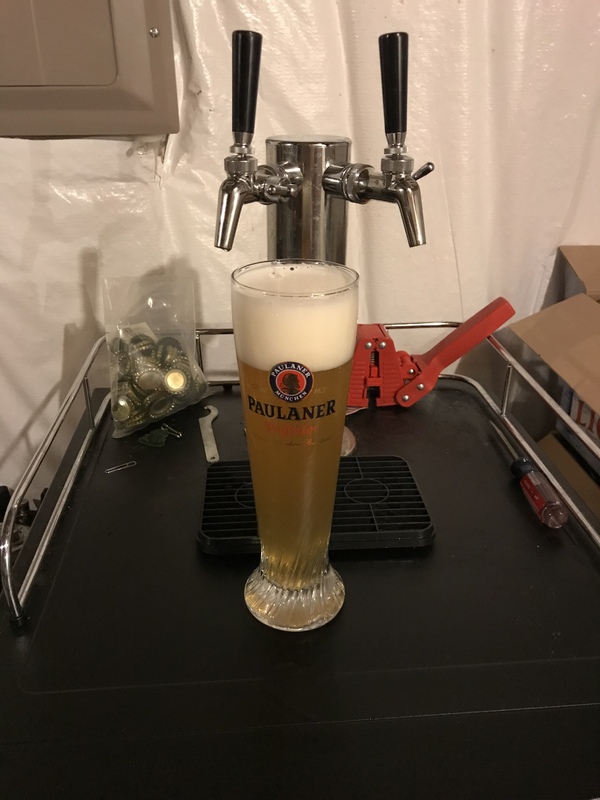 Don't always use the right glass but I do try. I have a collection of glasses. I hate the Shaker pint glass though except for water. Brined boneless, skinless chicken breasts go in the smoker in about five minutes. Half gallon of water with half cup each sugar and salt for the brine. Half hour in a zip loc then just drain the brine off and on they go. I never rinse the brine off. Lots of 1/2s in this so I can remember it even after (later) a few homebrews. If we moderate this afternoon I might remember to post a photo but it's looking like a nice day and opening day of walleye on the lake so behavior may be optional.